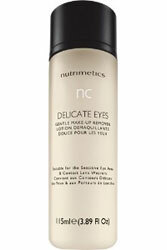 Nutrimetics Delicate Eyes Gentle Make-Up Remover is a gentle but highly effective cleanser for extra delicate skin around hte eye area. to minimise the risk of irriation and inflammation, it is important to cleanse away everyday eye make-up. nc Delicate Eyes Gentle Make-Up Remover is formulated with Calendula and Balm Mint Extracts to soothe, calm and moisturise the skin as it gentlylifts make-up debris away. Dermatologically and ophthalmologically tested. The delicate skin is left feeling refreshed, clean and lightly moisturised, with the risk of irritation completely minimised. Suitable for the sensitive eye area and contact lens wearers.